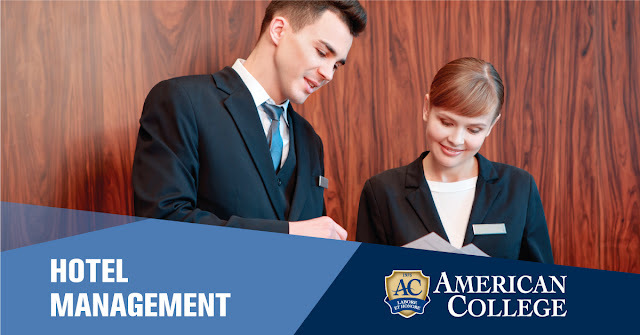 Students enrolled in this two-year program earn a diploma in Hotel Management. The program is designed to prepare its graduates to assume entry-level management positions in all types of hospitality organizations. To offer a comprehensive survey of the hospitality industry and heighten the sensitivity of students to the problems of managing people and serving the public. To offer a comprehensive study of the departments and functions of contemporary hotels including instruction of basic operating principles and concepts. To provide students a broad understanding of the fundamental principles and theories of the basic areas of business relating to the fundamentals of management within the hospitality industry. To offer training within the hospitality industry providing students with the opportunity to integrate their academic skills with practical work experience. To provide a solid academic, technical and intellectual background that would enable students to pursue higher studies in hotel management or other related fields. Apply critical thinking and develop basic analytical, problem-solving and decision- making skills. Relate to the hospitality industry and be alert to the problems of managing people and serving the public. Demonstrate an understanding of the departments and functions of contemporary hotels including the basic operating principles and concepts. Acquire knowledge of the fundamental principles and theories of the basic areas of business and relate them to the fundamentals of management within the hospitality industry. Acquire a training experience within the hospitality industry putting theory into practice. Develop academic, technical and intellectual skills that would enable them to pursue higher studies in hotel management or other related fields. Seek employment at supervisory level positions within the hospitality sector.